Data behind a wealth tax | This is Ashok. Edit: There are quite a few negatives that I didn’t address, as Evan Soltas points out. I think (1) and (2) are sufficiently mitigated by an exemption and amortization of tax burden over time, but the coordination of this policy definitely requires some more thinking on my part. I graphed what economist’s call the “wage share of GDP” out of curiosity. Take a farm that sells wheat. Before the industrial revolution, there might be many farmhands who would each earn a wage to work the farm, producing n kilograms of grain. Assuming this farm has no capital, the wage share of total income is 100% (distributed in some manner among the farmers). Now consider the landlord buys a tractor, allowing him to save 60% of his outlays by laying off the worst farmers. Because it’s a nice tractor, he can still produce n kilos of grain. Economists would say the wage share of income has fallen to 40%, and the capital share of income has increased to 60%. You don’t need to be Nancy Drew to figure out that this is broadly what’s happened to the American economy with the advent of ever-more-powerful technology. This is a good thing, but needs to be handled with care. A worker is by definition the owner of his labor (and hence the income derived thereof), but the capitalist is the owner of the machine (and hence the income derived from technological advances). Where does this tie in with wealth inequality? By saving money in mutual funds, companies you think will succeed, and even a bank you are accumulating capital. And yet, in 2010, the top 1% owned 35% of all mutual funds and 61.4% of all business equity. 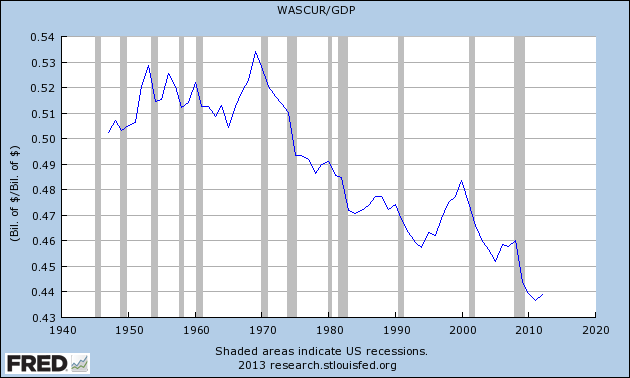 Wages will continue to fall as a percent of GDP. If they didn’t, it would imply that natural evolution can somehow beat human ingenuity. It took millions of years for nature to create sentient life, and yet glimpses in the long years of human history for us to create computers. 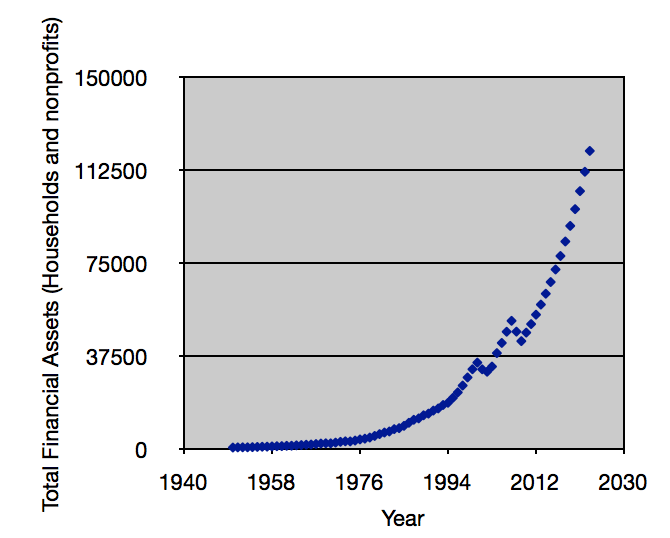 In light of this trend, income taxes will become increasingly irrelevant. But what are the numbers behind a wealth tax? Is it sustainable? Would it erode wealth? Could it really replace income taxation? Several things are pretty clear. 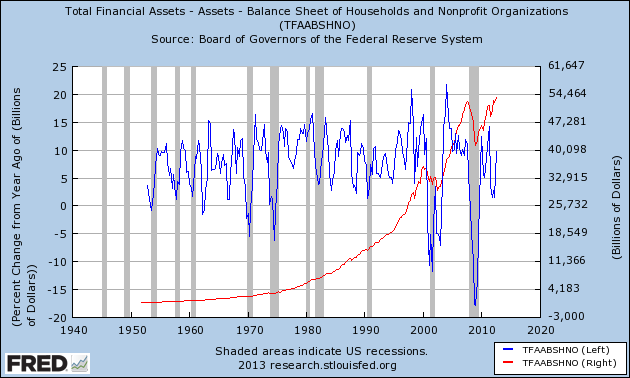 Wealth has almost always increased year-on-year, with the exception of the dot-com bust and the subprime mortgage crisis (a quick aside here to direct interested readers to The Banker’s New Clothes, which explains why the latter created a long recession and the former was a blip. Hint: equity is safer than debt). 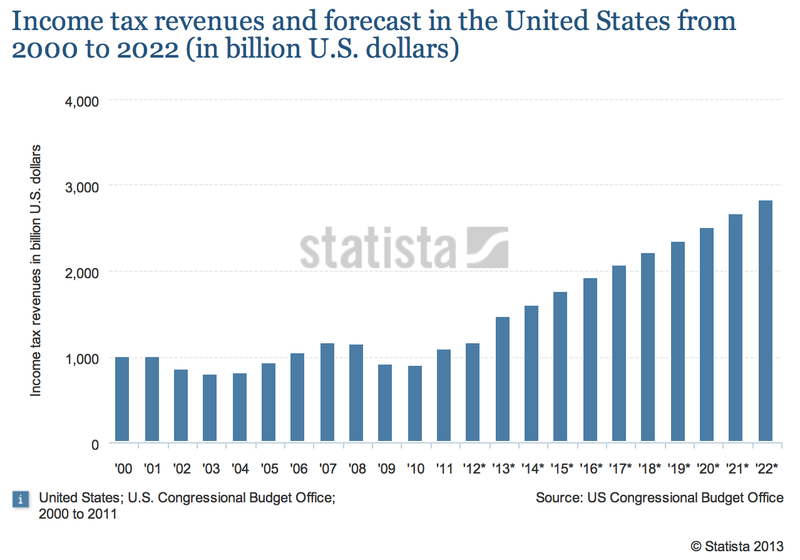 Total income tax revenues is projected at 21.3 trillion US dollars. At an average wealth tax rate of 2.5%, the corresponding figure would be 20.6 trillion US dollars. Pretty similar. (And it’s growing faster, as well). I hope this post has demonstrated that a wealth tax is fiscally feasible, and socially egalitarian in the face of an ever-mechanized economy. Incidentally, the United States is one of the few nations that can really succeed with this kind of a taxation system because of its international jurisdiction on assets. France tried, and failed – but to be fair, France also had a highly-progressive income tax scheme which doubly-burdned the affluent. I’m proposing a complete replacement of a highly complex system. A wealth tax would also be well-supplemented with a progressive consumption tax on carbon, sugar, and cigarettes – balancing out any non-market incentives to save or consume, while at the same time ridding the country of associated external costs. I truly believe this reform can achieve a bipartisan consensus. Much of the country would be grateful to be rid of an awful income tax system. Indeed our tax code is so complex, that accounting costs represent 4% of overall revenue (enough, for example, to achieve the Simpson-Bowles goal without increasing tax rates). Of course, since I hear very little noise in the news world of any such reform, I doubt it will come to pass – but I would love to hear some debate. Pingback: Why wealth taxation may not erode capital formation (and why it’s good for immigration) | This is Ashok. hey there and thanks to your information – I’ve definitely picked up something new from right here. I did however expertise a few technical points using this site, as I experienced to reload the site many occasions prior to I may just get it to load properly. I were pondering if your web hosting is OK? No longer that I’m complaining, but slow loading instances occasions will often have an effect on your placement in google and could damage your high-quality rating if advertising and ***********|advertising|advertising|advertising and *********** with Adwords. Anyway I’m including this RSS to my e-mail and can glance out for a lot more of your respective interesting content. Make sure you update this once more soon..
Pingback: Wealth Taxes and Immigrants | This is Ashok. particular issue evolve as time passes. Weight training helps you to tone up your body, build more muscle, and burn off fat. appetite. Weight training also improves functional ability and mood. I did however expertise a few technical points using this website, as I experienced to reload the website a lot of times previous to I could get it to load correctly. score if advertising and marketing with Adwords. Anyway I am adding this RSS to my email and could look out for a lot more of your respective intriguing content. on the cartesian product in front making a leverage. divers opinions from those who suffer bought the products ahead. undergo an encroachment on the gross sales of those products. manner in which they are scripted. At times, it lavatory too be based upon the populate who publish them. written based on the customer undergo and non whatever early personal reasons. That is the alone way through with which they john be utilitarian to you as the line of work proprietor and your sensed customers.